Milk. The very word conjures up a sense of gentle generosity and creamy delight. From the first moment mankind discovered the pleasures of warm cow’s milk, we have harvested this popular food in daily consumption for centuries. However, there are some – notably colon specialists and some dieticians – who believe that cow’s milk is for baby cows and not for humans. It’s a fierce debate – particularly if you are a dairy producer. To satisfy the spectrum of concerns, milk has been scrutinised, pasteurised, de-fatterised, slimmerised, and in some cases vilified to point where even if drained to a shadow of its former self, some people will still prefer alternatives made from nuts and rice. Despite this divide, there are strong facts in favour of milk. The health benefits appear numerous and include important bone-building nutrients such as: calcium, Vitamin D, protein, phosphorus, magnesium, potassium, vitamin B12 and zinc. Protein: As milk is a ‘complete’ protein, it provides the full mix of essential amino acids – building lean muscle and keeping bones strong. Calcium: You might be happy to know that you can swap a wagon load of boring broccoli for a glass of milk. You would need at least 7 cups of broccoli to get as much calcium as you do from an 8-ounce glass of milk. Potassium: A glass of milk can give you nearly as much potassium as a banana. Potassium is vital for assisting with the regulation of the balance of fluids in your body and helps to keep a healthy blood pressure. Vitamin D: You can get up to 30% of this essential vitamin from one glass of milk. Vitamin D works in conjunction with calcium to build and maintain strong bones, helping to prevent the potential onset of osteoporosis. Vitamin B12: This vitamin helps build red blood cells, giving you energy and helping to maintain the central nervous system. Servings of milk in either a glass or in food form may give you up to 20% of your recommended daily needs. Phosphorus: A vital nutrient in milk, phosphorus is also known as B3 and works with calcium and Vitamin D to maintain bone health. It also works in concert with Vitamin B12 to help convert food into energy. 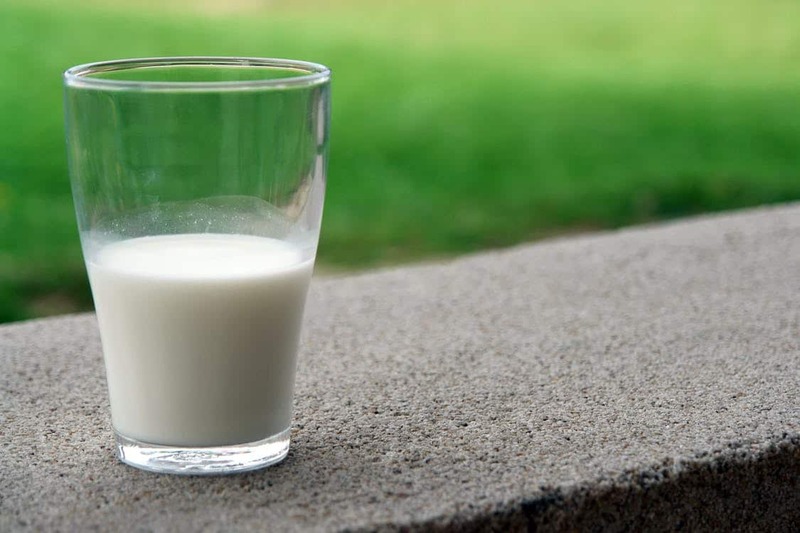 A full glass of milk or two a day can give you up to 25% of daily requirements. Milk is an important component of a diet designed to reduce the risk of high blood pressure, provided you are serving low-fat and fat-free milk, yogurt and cheese, along with fruits and vegetables. Lowering the blood pressure lowers the risk of heart disease and stroke. Milk still holds far more nutrition than popular non-dairy options such as rice milk, cashew or soy. And there’s eight times more protein in your glass of milk than in the alternatives. The nine essential nutriments remain in milk whether you enjoy low fat, fat-free or organic milk. The Vitamin B’s in milk, along with Vitamin D, work in superior concert with calcium to influence better bone health throughout life. Organic milk simply means that cows and their feed are more carefully monitored. The farmer is expected to farm without using synthetic fertilisers, growth hormones, antibiotics or GMO crops for their cows’ feed. Farming processes are integrated to promote an ecological balance and conserve biodiversity. For many who eschew cow’s milk, it’s not a matter of allergies, nutrition or health – it’s about the treatment of the animals who provide this product. And the fact of the matter is that when you look into this world, there are some serious concerns with regard to our relationship with animals and how we treat them in our food chain. Many people think cows produce milk all the time because they happen to be cows. This is not true. Cow’s milk is mother’s milk – and it’s meant for the baby she has just had. In most instances, this baby is taken away so that we can harvest its food for ourselves. Male calves are shut into tiny hutches for six weeks to two months to await slaughter for veal. The females are taken to be groomed as the next generation of milking cows. Vegans question the cruelty of the cow’s life, tied in a shed, artificially inseminated, birthing her baby – and then losing it when it is far too young to be taken away. In some farming, additives are placed in the cow’s feed, including antibiotics, because intensively farmed cows tend to get sick. As a result of this perceived abuse, many people have turned away from the natural goodness of cow’s milk and chosen alternatives such as: almond milk, soya milk, rice milk, coconut milk, etc. All of these have their own levels of nutrition – and also the sense of a good conscience. But the move away from milk for many reasons, such as dairy aversion, lactose intolerance and abhorrence of farming methods, has been significant, and farmers are having to change their attitudes and methods to meet the challenges. Too many people are now questioning the continued health value of milk in relation to its mass production. Clover Care: A quality, great tasting milk you know and love from Clover, but now enriched with vitamins, amino acids and minerals to give the whole family the nutritional boost they need to stay healthy. Clover Nolac Lactose-Free Milk: New Clover NoLacTM Lactose Free Milk is easy for lactose intolerant people to digest because it has been pre-treated with the enzyme lactase to break down lactose.